Oy, what a week it's been. On Tuesday, I got stepped on and kicked in the calf within 8 counts of music while salsa dancing. Thursday was the bad day to end all bad days, capped off by me falling, ruining my sandals, and bleeding through my skirt. Then today I find out from my guilt-ridden mother that she accidentally got stain remover on the brown pattern of that skirt, and it leached away some of the dye, leaving a faded yellowy spot on the pattern. She felt so bad about ruining the skirt she's given me money to buy a replacement skirt. I think I'm going to keep the skirt anyway because it's irreplaceable (I bought it in Mexico), and the damage isn't immediately noticeable. The money will go towards a trip I'm planning for October. Given all that's happened to me this week, I need a couple more lucky stars shining over me. 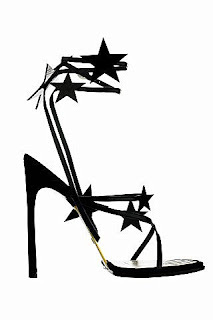 Until the universe gets its act together, I'll settle for the stars on these YSL star sandals. Stars are so cute right now. I love these.